After 2 months working in Taos, New Mexico, with the Earthship crew, we traveled down to Las Cruces in southern New Mexico with Maria, a fellow volunteer. We met up with our friend Lance, who we met a few months earlier in Haiti, and traveled together to Mexico City by bus. 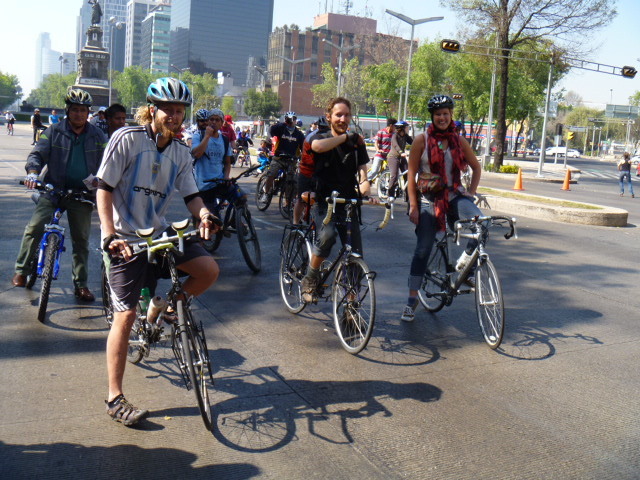 In Mexico City we stayed with Sethaly through ‘Warm Showers’, a platform similar to Couch surfing, but especially for touring cyclists, where fellow cyclists offer a bed and a ‘warm shower’ to touring cyclists passing through. We toured around the city, visiting sustainable projects and museums, all by bicycle, as the city was surprisingly bicycle friendly! Sunday is car free in 32 km of the city’s center, so we took the opportunity to head out in the afternoon with all our gear to meet up with Hannah, who we met in Haiti as well, and her Mexican beloved Alex, who has a bit of land with other permaculture enthusiasts on the fringe of the city to experiment with. We loaded all our belongings on a boat named ‘sinking boat’ (a boat that partly sinks, a scary experience with 5 people, 5 bicycles and their camping stuff!) and peddled to the land along the ingenious Chenampa system of canals and wetlands to camp out. 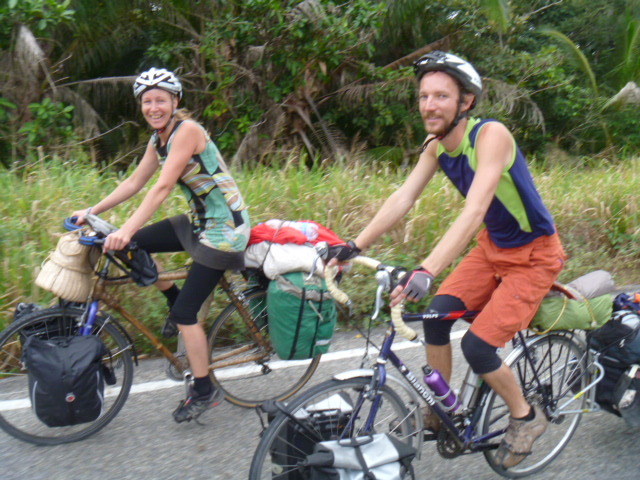 We traveled to the coast, south of Vera Cruz with Lance, and cycled along the beautiful tropical coast. The route was beautiful and quiet due to its remoteness, but we did encounter some roadblocks and sandy dirt roads where we had to push our way through. We put up our tents at random places along the road, such as early Mam ruins, a primary school ground and next to a gas station. The next day we steamed fish in palm leaves on wood fire with the family, and said goodbyes. The family continued their celebrations for another 3 days, and told us how in the afternoon they would slaughter a cow! We pulled ourselves away from their heart warming hospitality and continued our way to Palenque in Chiapas. The date 21/12/2012 marks the end of this cycle of the Mayan calendar, and the sacred Mayan sire with its ancient ruins seemed to be a nice place to spend this special time. There was a Rainbow gathering on the fringe of town, 20 km from the ruins, so we set up camp there for 2 weeks. Our tent held out really well, but many people got washed away by the rains. The 21st was a wet and rainy day, not exactly the magical time and an extra special birthday for Mykal we thought it would be. The gathering itself was a party festival with thousands of people, not the family and spiritual gathering we were hoping for. Also we had the opportunity to spend time at the breathtakingly beautiful ruins -on the full moon night we hid ourselves in the bushes after dark, and climbed the largest structure named ‘the palace’ from where we saw the full moon rise. After new years we got back on the road, climbing the mountains to San Cristobal de las Casa, Chiapas’ capital and centre for arts and counter culture of the area. 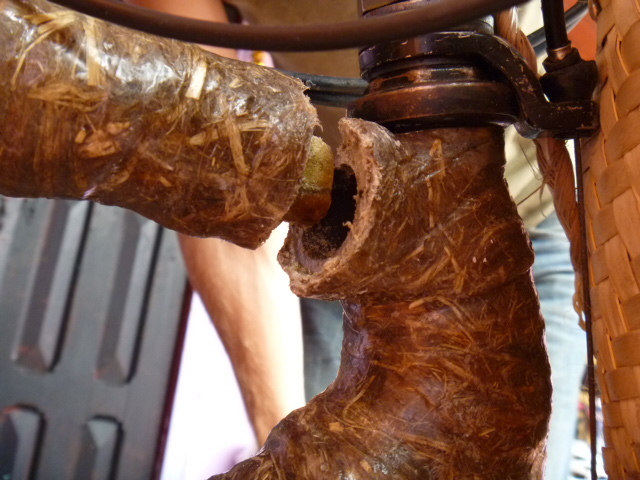 However, while climbing a mountain the bamboo bicycle cracked at the front joint! Ai! This joint was the least re enforced of all, and the when it broke, the lower front tube cracked as well! Ai! Luckily it was an uphill, not a downhill, and Nico didn’t get hurt! 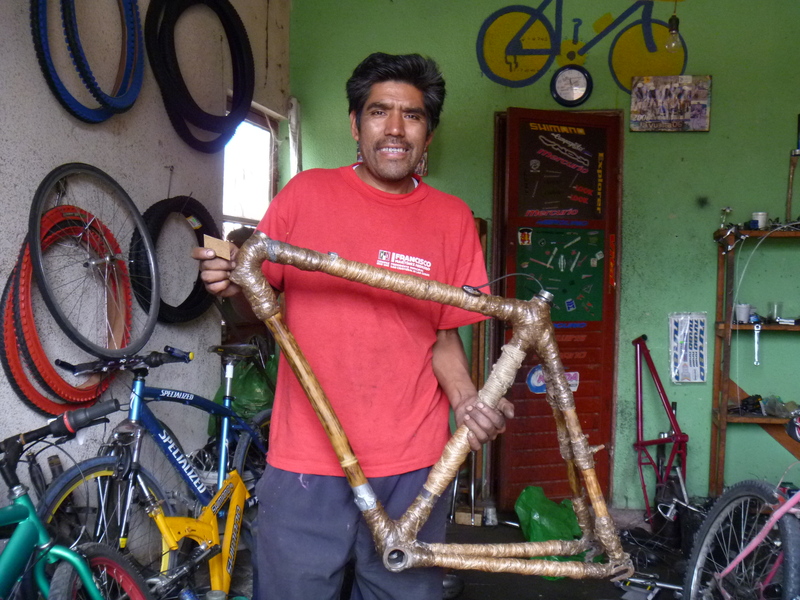 The bamboo frame we donated to autonomous center to Casa de la Libertad in San Cristobal, who will team up with Jaguar de Madeira centre for bio-construction to give her a second life as a bamboo bicycle blender! 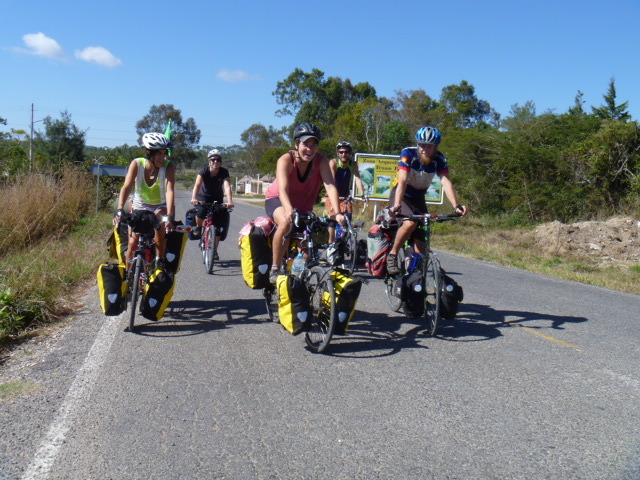 In San Cristobal we met up with 2 fellow cyclists from Spain, Alex and Ina, our friend Lance and another American Michaela, to form a bicycle caravan to Guatemala! The road took us along some nice camp spots, in nature, in people’s backyard and fields. One primary school even offered us an apartment, and we were invited to ‘teach’ about our bicycle journey the next day in class with the big kids! We spend a few days at Lagos de Montebello national park before we say goodbyes to Lance who stayed in Mexico, while the rest of us continued over the border to a small Guatemalan town named ‘Gracias a Dios’ (trans. ‘Thanks to God’, or ‘Thank You, Goodbye’ : ) and beyond into Guatemala with its many hills! Michaela stayed in San Antonio, the rest of us discovered the main road was ‘broken’, so hitched a ride with a truck, along bumpy dirt tracks to ‘Todos Santos’ (trans. ‘Everything is Holy’). Almost every one wears the same colourful traditional clothes in Todos Santos; Men wear red/white striped pants with shirts with large embroidered collars, women wear colourful fold around skirts and richly embroidered blouses with a belt tight around the waist. We pushed up the last hill, to cross the highest mountains of central America, and then 20km steep down down down to Huehuetenango (the locals call the town ‘Wayway’) where the volunteer fire fighters offered us a patch of grass next to the fire trucks to put our tents and a warm shower. Interestingly, fire fighters in most of Central America are not funded by the government, but the fire fighting force consists of volunteers that get the funding for equipment from donations, for example for usage of public toilets or private donations from people at the market.